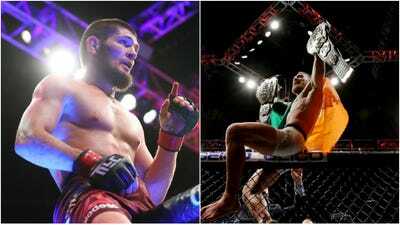 Getty ImagesUFC 229 pits UFC lightweight champion Khabib Nurmagomedov against Conor McGregor. Conor McGregor has booked a comeback bout in the UFC. The wildly popular Irishman is set to challenge modern rival Khabib Nurmagomedov at UFC 229. The event is scheduled to take place at the T-Mobile Arena in Las Vegas on Saturday, October 6. Read all of Business Insider’s UFC 229 coverage right here. Conor McGregor and Khabib Nurmagomedov have the chance to settle their differences within the confines of a 750-square-foot cage tonight. The two lightweight fighters could contest one of the best fights of the year as the match-up presents an elite striker with concussive power in McGregor against a champion with intimidating strength, grappling, and wrestling skills in Nurmagomedov. The fight involves a backstory that gripped the sports world in April, when McGregor was seen on video throwing guardrails at a bus carrying UFC fighters – an extraordinary attack that hospitalised two athletes. UFC boss Dana White later claimed McGregor was motivated to confront Nurmagomedov, who had slapped McGregor’s close friend Artem Lobov, and was on the bus at the time of the attack. McGregor and Nurmagomedov did not fight that night, but have the chance to punch, elbow, and choke each other at UFC 229 – an upcoming pay-per-view show scheduled to take place at the T-Mobile Arena in Las Vegas. When is UFC 229: Khabib vs. McGregor? UFC 229 will be a festival of fights as the event card features 12 bouts in total. Nurmagomedov and McGregor are the headline attraction and their fight for the UFC lightweight championship belt is due to take place on October 6, 2018. The main show will begin at 4 p.m. in Las Vegas, which means a 7 p.m. start if you live in New York. If you are in London, then expect to tune in at midnight. Yet the Nurmagomedov-McGregor fight will start at least three hours after this – potentially a lot later if the 11 previous bouts all go the distance. New York (ET): 10 p.m.
Las Vegas (PT): 7 p.m.
Los Angeles (PT): 7 p.m.
To put it simply: This fight involves Conor McGregor, a comeback story, and an undefeated champion in Nurmagomedov. But allow us to elaborate. First of all, McGregor is involved. You know him, we know him, everybody knows him. He’s known for his flashy lifestyle, an unrivalled trash-talk that sees him spare no soul – not even Richard Branson – and for controversial antics that include an in-cage meltdown. But none of us would know McGregor if it were not for the thing that made him famous in the first place – his instinctive kicks and his fists of fury that have rendered many an opponent unconscious. McGregor is one of the most elite fighters in UFC, and he returns for the first time in almost two years in October. His comeback is against Nurmagomedov, a Russian wrestler who has risen to the very top of the lightweight division, and was crowned champion during McGregor’s absence. Nurmagomedov has strength, elite grappling skills, and horrific ground-and-pound techniques. You should watch because this is a classic mesh of two completely different styles – the striker against the wrestler. Watch UFC’s promo video for UFC 229: Khabib vs. McGregor below. Audiences in the US will be able to watch the UFC 229 prelims on FX and UFC Fight Pass, the UFC’s official streaming network. Part of the event may be streamed on the FOX Sports GO app, but further details will be known closer to fight night. The main pay-per-view event will be carried on a number of networks including UFC TV, Prime Video pay-per-view, and AT&T U-verse. A full list is available on the UFC website here. To watch online via Fight Pass, click here. To watch on DIRECTV, go here. BT Sport will continue airing UFC in the UK until the end of the year, and therefore still has the rights to broadcast UFC 229 – arguably the last monster show before Eleven Sports succeed BT Sport as the go-to UK broadcaster for UFC fights. To watch UFC 229 in the UK online, head to the BT Sport page.